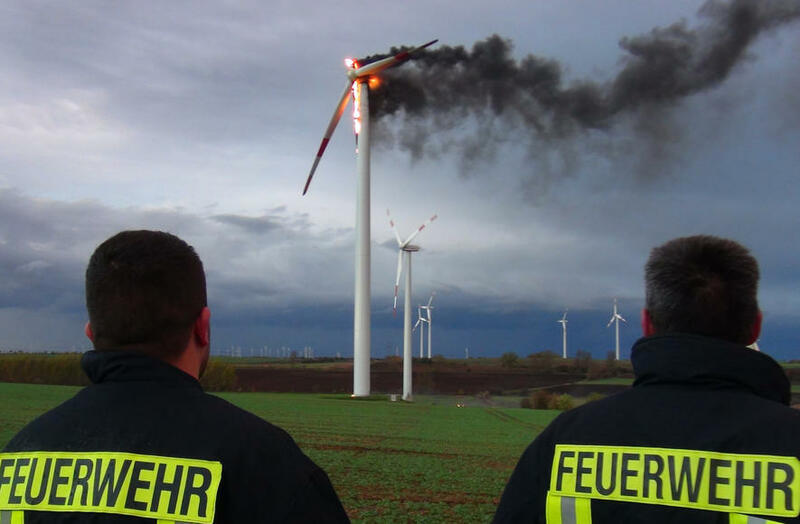 Wind Turbine Fires – Facing Up To The ‘Environmental Impact’ !?! 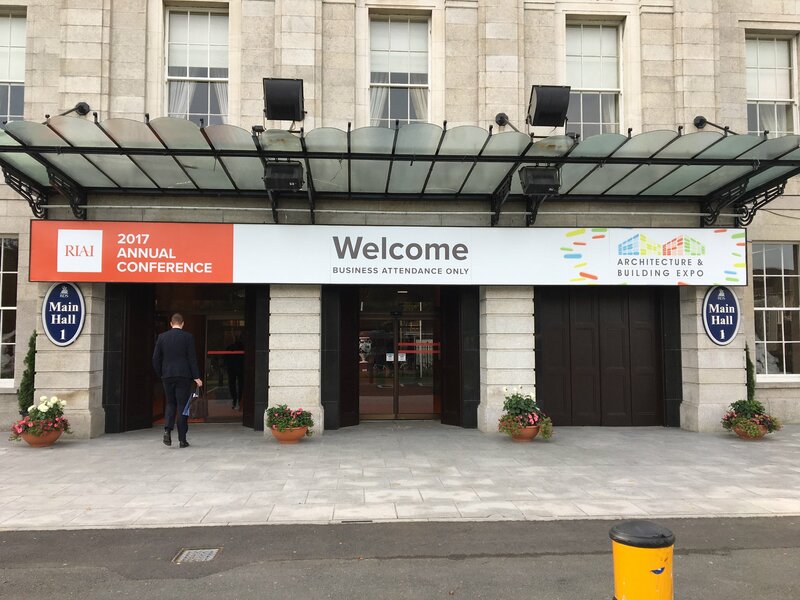 2016-04-19: A Priority Theme of SFE 2016 DUBLIN, next September, is the ‘Adverse Environmental Impact’ caused by Preventable Fires in the Built Environment. Last year’s horrendous devastation of large tracts of land, air and ground waters in the Tianjin port region of North-Eastern China is one very obvious example. BUT, consider also … Wind Turbine Fires. As we move closer and closer towards a planetary environmental precipice … there IS enormous pressure to harvest more and more energy from renewable, non-carbon resources. Windmills, of old, used wind energy to perform an important function in a local context. Everybody could see what was happening inside. Local people reaped the benefits. Modern wind turbines, on the other hand … ? But, at least, ‘it’ was mentioned in conversations ! The next major issue, the Fire Issue, is a different matter entirely. This problem does NOT exist … NEVER happens … NOBODY KNOWS NOTHING ! And not just in Ireland or Europe … the ‘real’ fire statistics are either ignored, massaged or concealed. remote, sometimes very difficult to reach geographical locations of wind turbines, particularly in the case of offshore installations. The cost of wind turbines and their components, as well as restoration and repair costs after a fire, increase in proportion to installed generating capacity. In addition, losses caused by service interruption also increase in a similar proportion. 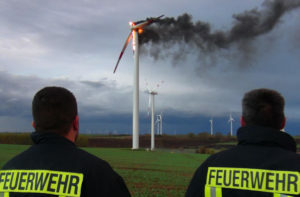 According to the loss experience of Insurers, fires in wind turbines can cause significant damage to property and have very high post-fire costs. in the electrical sub-station of the wind turbine or wind farm. Due to the high concentration of technical equipment and combustible material in the nacelle, fire can develop and spread rapidly. There is also the danger that the upper tower segment will be damaged. In the case of a total loss of the nacelle, restoration costs may well reach the original value of the whole turbine. These ‘Preventable’ Fire Losses Are NOT Sustainable ! PDF File, 601Kb – Click ‘CFPA-E Guideline’ link below to download. 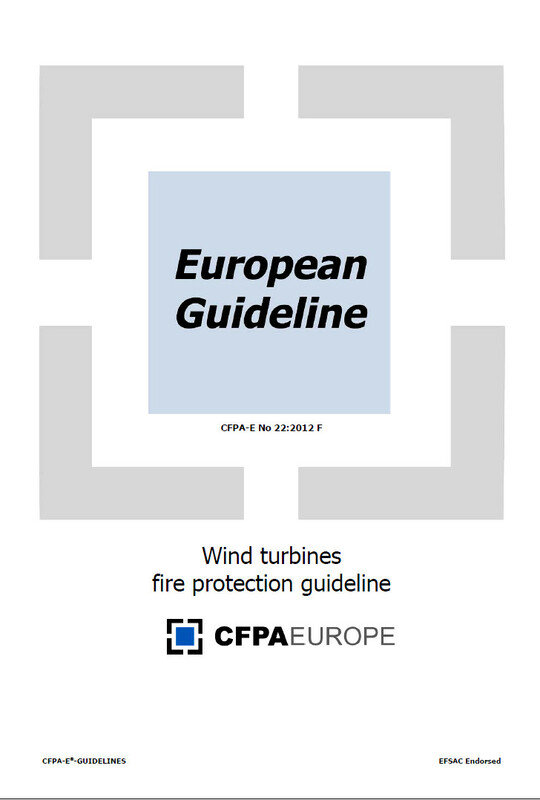 Which is why, in September 2012, the European Fire Protection Associations decided to publish a common guideline in order to ensure similar interpretations in the different European countries … and to give examples of acceptable solutions, concepts and models. The Confederation of Fire Protection Associations in Europe (CFPA-E) aims to facilitate and support fire protection work. The European marketplace is constantly imposing new demands for quality and safety. According to CFPA-E, fire protection forms an integral part of a modern business strategy for survival and competitiveness. We thoroughly agree ! 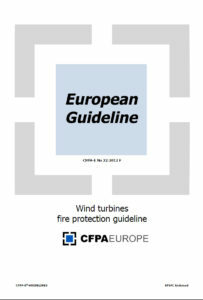 This CFPA-E Guideline (No.22 – September 2012) on Wind Turbine Fire Protection in Europe – produced by VdS Schadenverhütung and drafted by Hardy Rusch – is primarily intended for those people responsible for fire safety in companies and organizations. It is also addressed to fire services, consultants, safety companies, etc … so that, in the course of their work, they may be able to assist companies and organizations in increasing levels of fire safety. 2014-10-17: Within the professional discipline of Fire Engineering … either a building is ‘fire safe’, or it is not. The Design Philosophy of the Fire Engineer is irrelevant. In fact, nearly everybody involved with fire safety in buildings would collapse in a fit of laughter at the delusional notion that a design philosophy was relevant. People’s lives are at stake ! Similarly, now, we must begin to think and act in the simple terms of a building either being ‘accessible’, or not. At stake, this time, is the quality of life and living for very many vulnerable people in all of our societies. Accessibility for All, according to International Standard ISO 21542 (2011) … includes the approach, entry to and use of a building, egress during normal conditions and removal from the vicinity of the building … and, most importantly, evacuation during a fire incident to a ‘place of safety’ which is remote from the building. 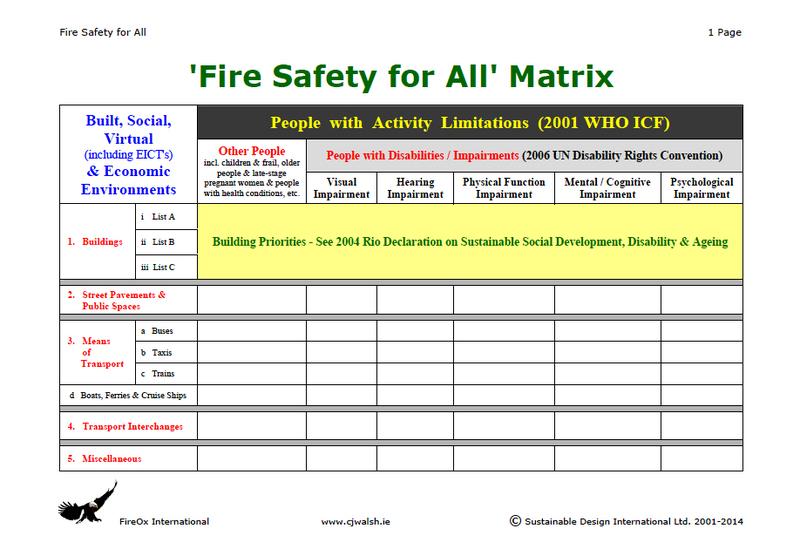 Concerning that All above … FireOx International’s ‘Fire Safety for All’ Matrix shows who exactly we are talking about … and who must be considered in the development of a Fire Safety Strategy for every building … not just some buildings ! This is not just good design practice … it is also mandated in International Human Rights Law. 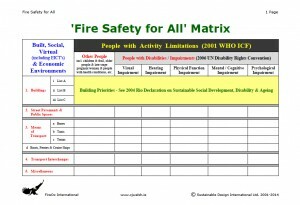 Colour image showing FireOx International’s ‘Fire Safety for All’ Matrix. Revised and Updated on 24 October 2014. FireOx International is the Fire Engineering Division of Sustainable Design International Ltd. (Ireland, Italy & Turkey). For a clearer and sharper print, download the PDF File below. Matrix developed by CJ Walsh. Latest revision suggested by Jo Kwan (Hong Kong). Building Fire Safety Codes and Standards exist in almost every country. 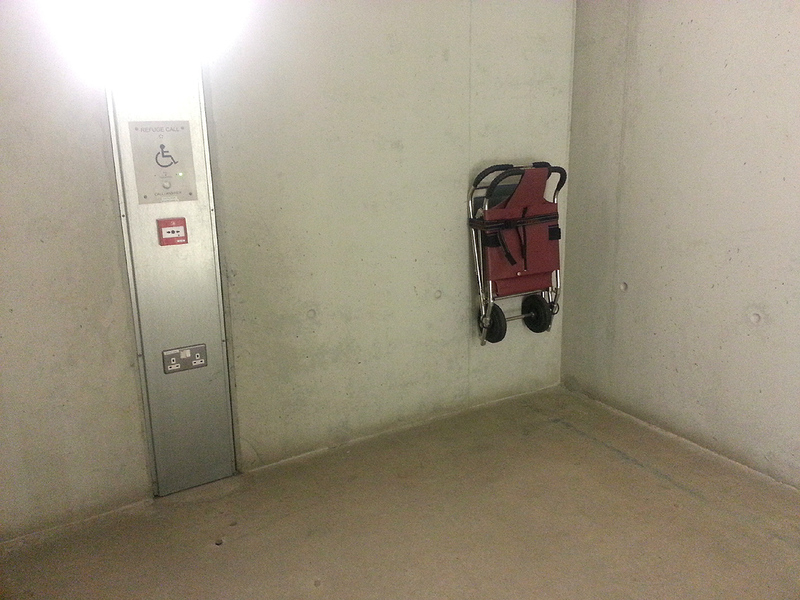 However – IF they exist at all – those guidelines relating to the Fire Safety of People with Activity Limitations are technically inadequate, entirely tokenistic and/or blatantly discriminatory. 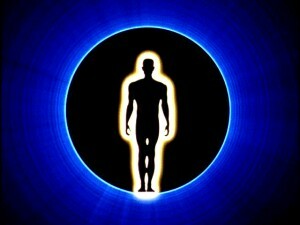 Refer to my previous post … BS 9999:2008 & BS 8300:2009 – Sleepwalking into Problems ? Adapted to Local Context and Heritage (fr: le Patrimoine – see ICOMOS 2011) … geography, climate (incl. change, variability and severity swings), social need, culture, and economy, etc., etc. ‘Person-Centredness’ is a core value of Sustainable Human & Social Development … an essential principle in Sustainable Design … an indispensable support framework for Sustainability-related Policy and Decision-making … and an invaluable indicator when monitoring Sustainability Implementation. It is the mid-1990’s … in the centre of Dublin City. Imagine, if you will, a very large historical building having a civic, justice-related function … and also an enormous Energy Bill. 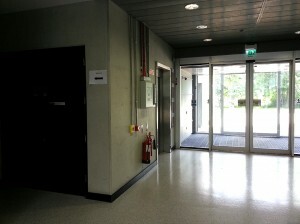 As described in a much earlier post, dated 2009-02-20, and the series of posts which followed on the subject of Building Energy Rating (BER) … we found that the most effective and practical remedy for this gaping and continuously haemorrhaging ‘energy’ wound was to approach the problem though the building’s users, their perception of thermal comfort, and International Standard ISO 7730. 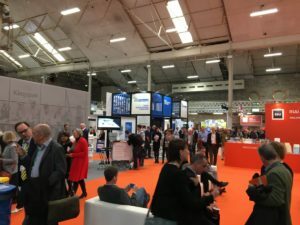 The ‘real’ reduction in energy consumption, the ‘real’ increase in the building’s energy efficiency, and the ‘real’ improvements in building user / employee comfort and morale … were astounding ! It is Sustainable Design – the art and science of the design, supervision of related construction/de-construction, and maintenance of sustainability in the Built Environment – which is currently generating a quantum leap in the forward evolution of a more coherent design philosophy. 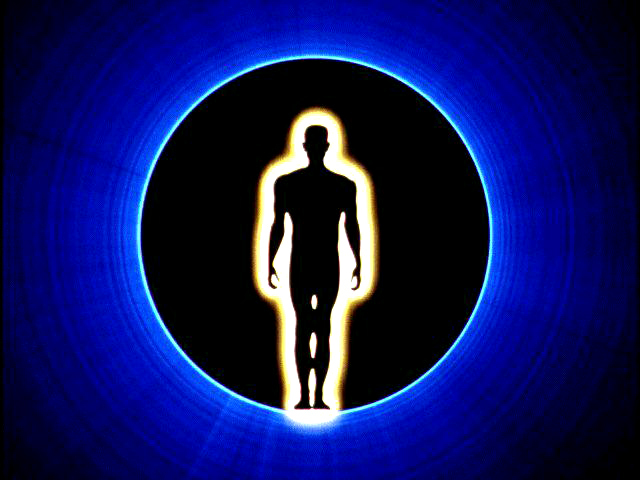 Deeply embedded, therefore, within this philosophy is the concept of ‘person-centredness’, i.e. that core design value which places real people at the centre of creative concerns, and gives due consideration to their health, safety, and welfare in the Built Environment – it includes such specific performance criteria as: a sensory rich and accessible (mobility, usability, communications and information) environment; fire safety; thermal comfort; air, light and visual quality; protection from ionizing / electromagnetic radiation; nuisance noise abatement; etc. An important ‘person-centred’ design aid is the questionnaire survey, which is not only a very valuable source of information, but formalizes meaningful consultation between practitioners and end users. SDI’s Guideline Framework on achieving equality of opportunity and social inclusion, which is based on a strategy produced by Directorate-General V of the European Commission, shows how further essential elements of ‘social wellbeing’ also relate to person-centredness; these include partnership between all sectors of society, consensus, transparency and openness. This paper explores the rational and legal basis for person-centredness of the Built Environment in Europe. Fieldwork incorporating this innovative approach is also examined. Finally, a body of principles – a European Charter – is outlined which aims to ensure that new construction works, and renovated existing buildings, perform reliably, are adaptable, accessible and responsive, ‘intelligently green’ (French: intelli-verdure), cost-effective and inherently sustainable. AND BEFORE developing Climate Change Policies which will have such dramatic impacts on human populations, and their lifestyles, around the globe … perhaps those policies would be more effective, in the ‘real’ world and in the long-term … if we looked at the problem through the ‘eyes’ of people ! Climate scientists have identified global warming as the most important environmental issue of our time, but it has taken over 20 years for the problem to penetrate the public discourse in even the most superficial manner. While some nations have done better than others, no nation has adequately reduced emissions and no nation has a base of public citizens that are sufficiently socially and politically engaged in response to climate change. 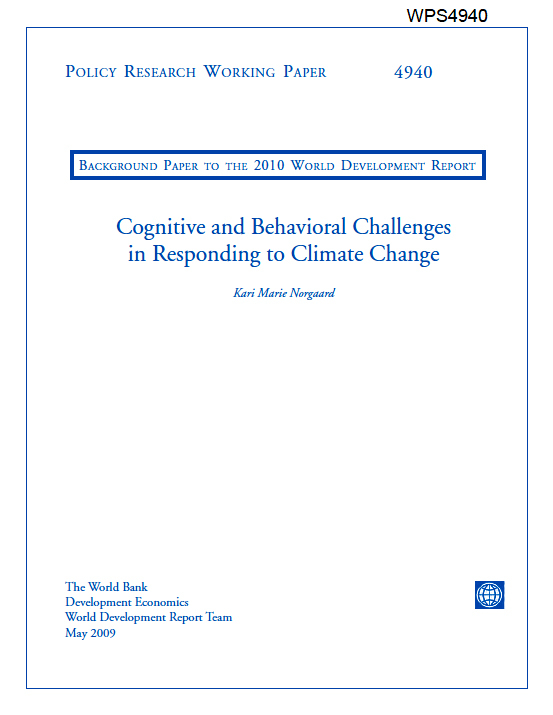 This paper summarizes international and national differences in levels of knowledge and concern regarding climate change, and the existing explanations for the worldwide failure of public response to climate change, drawing from psychology, social psychology and sociology. On the whole, the widely presumed links between public access to information on climate change and levels of concern and action are not supported. 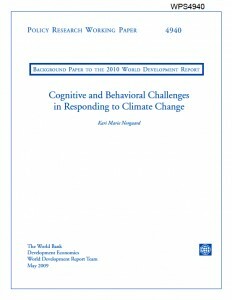 The paper’s key findings emphasize the presence of negative emotions in conjunction with global warming (fear, guilt, and helplessness), and the process of emotion management and cultural norms in the construction of a social reality in which climate change is held at arms length. Barriers in responding to climate change are placed into three broad categories: 1) psychological and conceptual; 2) social and cultural; and 3) structural (political economy). The author provides policy considerations and summarizes the policy implications of both psychological and conceptual barriers, and social and cultural barriers. An annotated bibliography is included. Is anybody learning yet ? 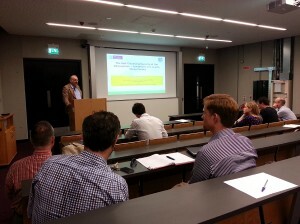 The Informatics Research Unit for Sustainable Engineering (IRUSE) in the Department of Civil Engineering … and The Ryan Institute for Environmental, Marine and Energy Research … both at the National University of Ireland Galway (NUIG) … have jointly organized a 1-Day National Research Networking Workshop which will take place on Monday, 24 June 2013. 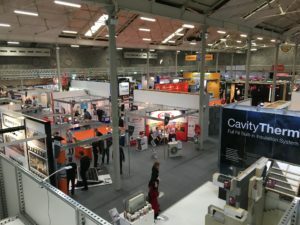 Fire Engineering … involves much more than mere compliance with building regulations and codes … whose fire safety objectives are limited, and whose performance requirements are sometimes inadequate and always minimal. More problematically … a fundamental conflict is mushrooming between Safe Sustainable Climate Resilient Building Design and Conventional Fire Consultancy Practice. Research Output must be targeted at practical implementation in ‘real’ buildings … with actual user/construction performance carefully (i.e. 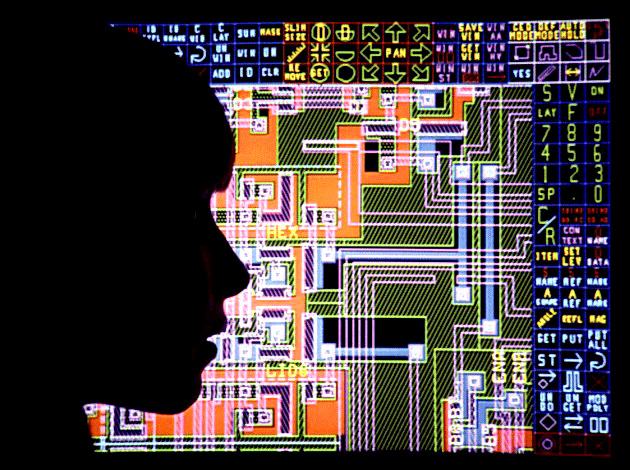 reliably and precisely) monitored ! While it was difficult to keep the Workshop Programme, involving a series of short 10-minute presentation slots, on track … discussions during the day were engaging, energetic and extensive. 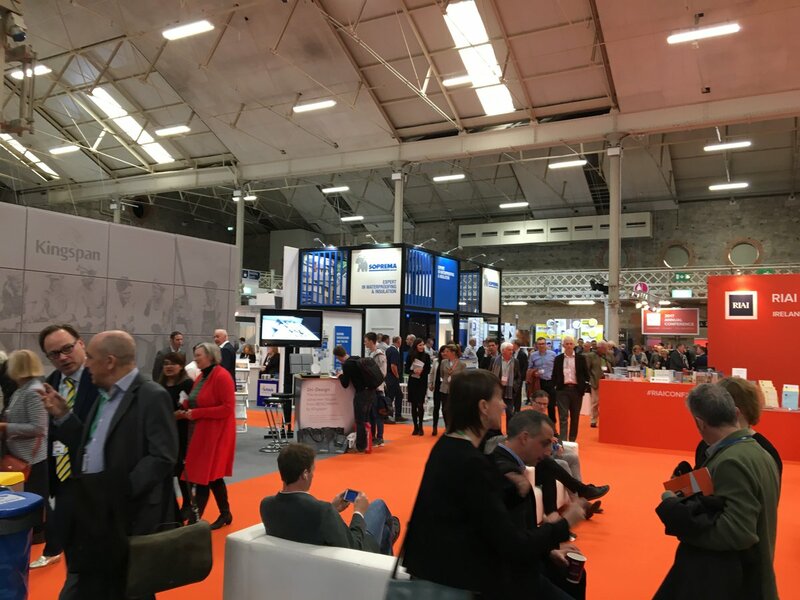 I happily look forward to a successful and collaborative outcome from the day … Multi-Disciplinary Teams producing Trans-Disciplinary Research Output … which is geared towards practical implementation in ‘real’ buildings, with actual construction and building user performance carefully (i.e. reliably and precisely) monitored ! Colour photograph showing the venue for the IRUSE & The Ryan Institute (Galway University – NUIG) Built Environment Research Networking Workshop, which was held in the New Engineering Building on 24 June 2013. Seen here is Dr. Harald Berresheim during his presentation on ‘The Self-Cleansing Capacity of Our Atmosphere – Limitations on Local to Global Scales’. Photograph taken by CJ Walsh. 2013-06-24. Click to enlarge. 1. The Minimum Life Cycle for a Sustainable Building is 100 Years … not 50 or 60 years ! 2. Future Research Collaboration should be targeted at the multi-aspect ‘Sustainability Agenda’. The word ‘green’ (where only environmental aspects of sustainability are considered) should be actively discouraged, if not banned entirely ! – Carbon Dioxide (CO2) Concentrations in a building should not significantly exceed average external levels – typically within the range of 300 parts per million (ppm) to 500 ppm – and should at no time exceed 800 ppm. Can you believe what’s in those photographs ?? More importantly … can you believe what’s not in those photographs ???? In such a recently completed building … “incredible” is the only answer to both questions. Under International Law … lack of accessibility, or inadequate accessibility, to the social, built, virtual and economic environments … IS a denial and infringement of the basic human rights of people with activity limitations. It also limits, needlessly and unnecessarily, the numbers of potential users of those environments … which makes no sense at all. 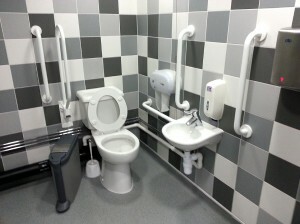 My strong recommendation to Galway University … is to immediately commission a Competent Accessibility Consultant to give the university campus a thorough going over ! 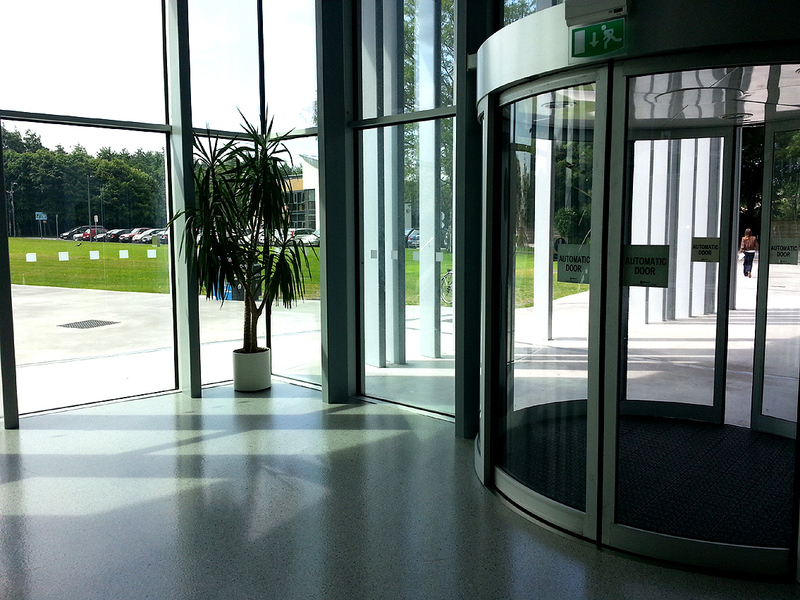 You are failing the campus user population … the local community in Galway … and Irish society generally. My even stronger recommendation to the Architects for the New Engineering Building … RMJM Architects (Robert Matthew Johnson-Marshall) in Scotland, and Taylor Architects in Ireland … is to always commission a Competent Accessibility Consultant on all of your projects … small, medium and large … because you haven’t a bull’s notion about this important dimension of building performance !! 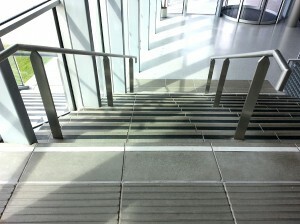 And remember folks … Accessibility has been clearly specified in the new International Standard ISO 21542 as including … ‘access to buildings, circulation within buildings and their use, egress from buildings in the normal course of events, and evacuation in the event of an emergency’.